So accidents happen and sometimes wool sweaters go through the washer...and the dryer. I have 3 sweaters that have met this fate and they've been stuffed in a storage drawer awaiting the day that they could be upcycled into something useful. Originally I was thinking of making some stuffed animals for a lucky baby (I even bought the child-safe toy eyes), but I was never motivated enough to get one going. 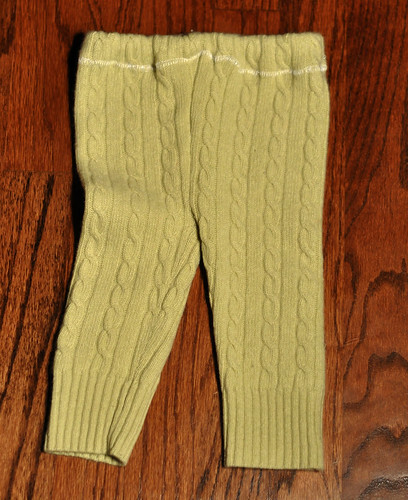 Last weekend I was flipping through one of my new favorite blogs, Prudent Baby, and found these great instructions for DIY Recycled Baby Pants. Now, I have to admit, I have a new sewing machine and you can probably tell from the Little Blue Bird that I'm still getting used to it (my stitching a little shaky still), but the pants were a complete success. I even had the correct elastic on hand to make them in under 30 minutes! Give them a try and let me know how it went. I'm going to tackle another pair this weekend.